The Voyage of Discovery’s Part 1: Phase 5 Newfoundland & Labrador (Segment 1) and The Voyage of Discovery’s Part 1: Phase 5 Newfoundland & Labrador (Segment 2) wrapped up the main highlights before and during the trip up to Newfoundland and Labrador; however, the Trans-Labrador Highway added a whole new level of adventure! A unique and adventurous experience that will all be revealed here. 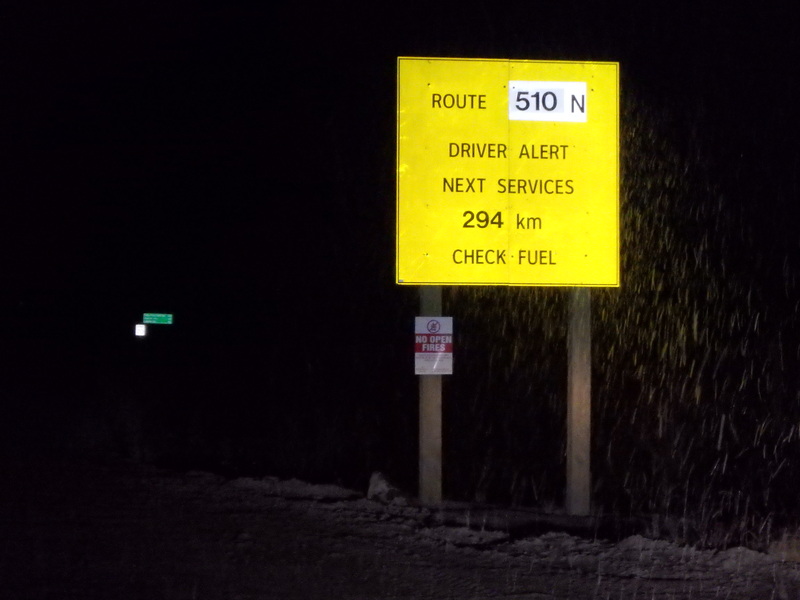 Trans-Labrador Highway, is often referred to as the “world’s loneliest road” or the “most dangerous road.” I had spent months meticulously planning this particular route and at the start of winter in the far North-Eastern part of Canada. 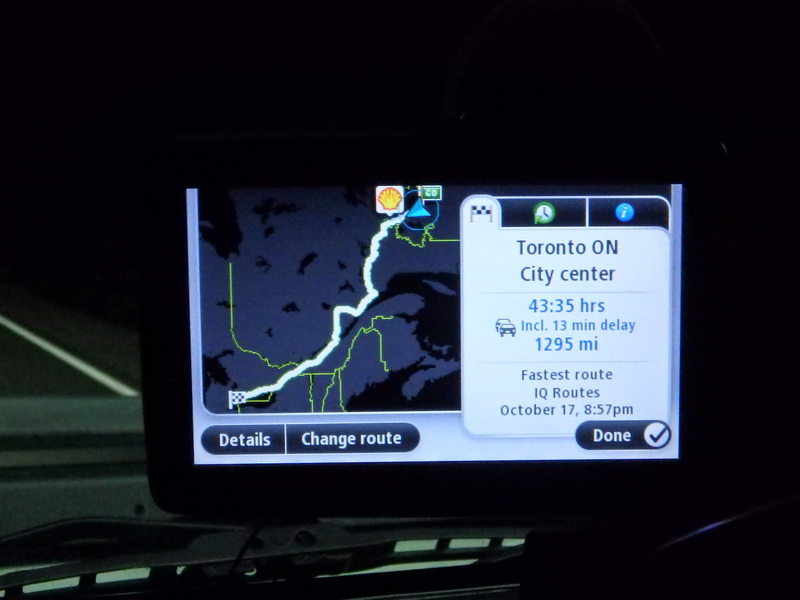 I wanted to complete this last portion of my tour, since after this trip, I would have driven the entire Eastern Part of North America. This was an accomplishment that took me exactly a year to achieve while balancing a full-time career as a Marine Mammal Scientist and my own personal world tour. 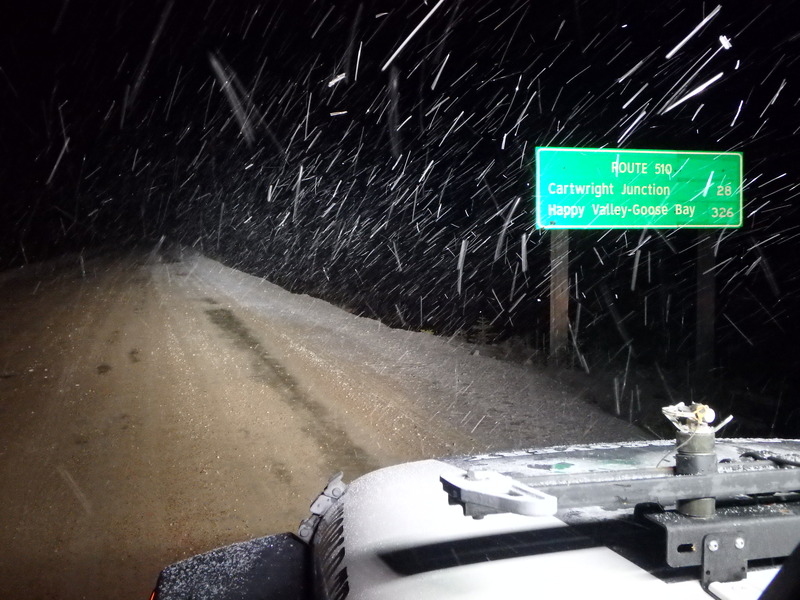 This was it, this was my moment to shine, and in October I was going to tackle one of the most isolated routes in the world, the Trans-Labrador Highway! August’s last segment of the world tour was absolutely brilliant – ice bergs, humpback whales, UNESCO World Heritage Sites, to name a few. 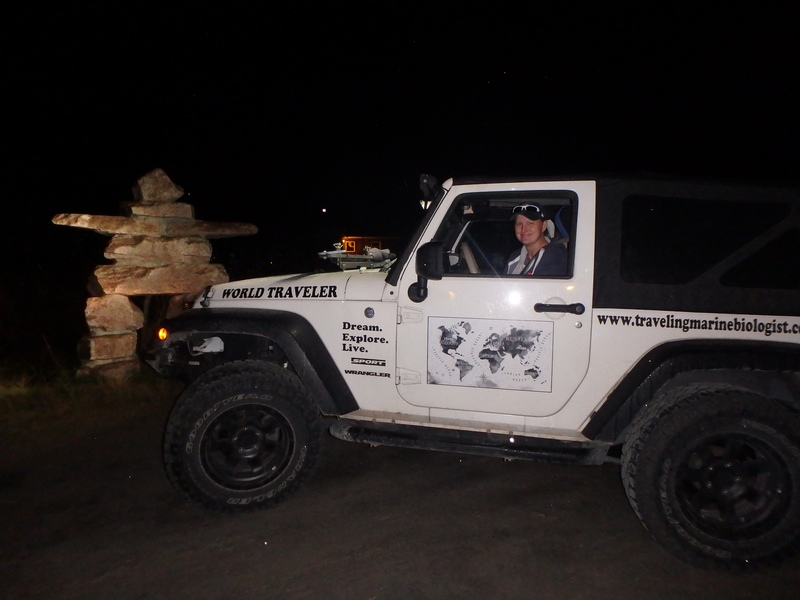 I was able to discover new terrain in Newfoundland, off-road in some of the most remote places that I have been to with my Jeep, and spend a few days in Labrador exploring Labrador’s Coastal Highway. I had just left a project in Colombia and was scheduled to head back in September, a month later. I had already spent a few weeks in Newfoundland, and was pushed for time. I could not continue my world tour to Central Canada and not fully embrace this untouched part of the world. 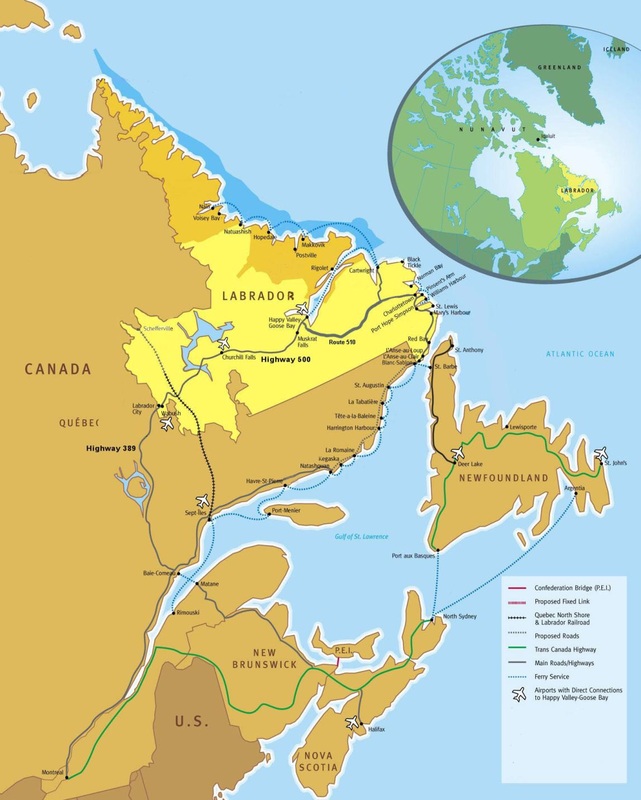 I decided that I would plan my tour for October, and continue my route of ferrying and driving through Newfoundland to reach Labrador with my trusty sidekick, my middle brother Josh. 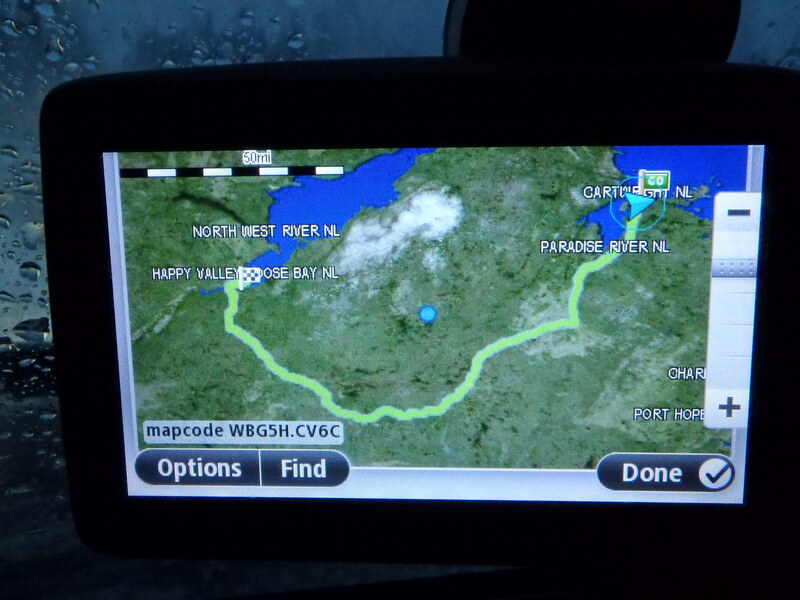 The Voyage of Discovery’s Part 1: Phase 4 Newfoundland & Labrador edition had finished. I made enough time to quickly drive back down to Myrtle Beach, SC, unpack from that tour, re-pack for my upcoming project, and head to the airport for my September project in Colombia. While I was on the plane all I could think about was that I needed to drive back up there, pack more survival kits, and complete my tour of Labrador. Most of my good friends and family will know that when I am at work, this gives me time to plan for my next joint around the world, really wherever my head is at that moment. 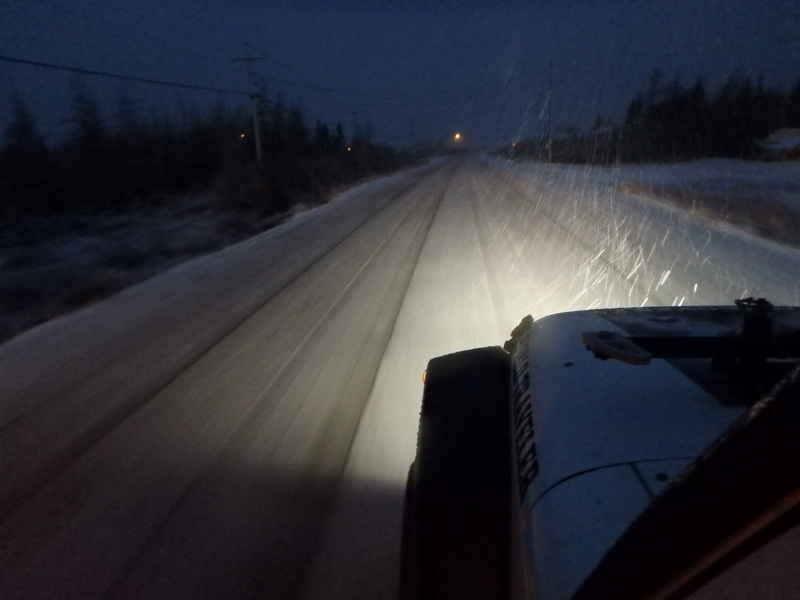 Majority of the holidays are adventure-related in one way or other, and this particular time with the continuation of my driving my Jeep around the world, this most extreme adventure was going to be tackling the Trans-Labrador Highway. I laid out all my routes, looked up the gas stations in between, emailed accommodations and RV parks, computed my mileage in between towns, and even went as far to research small convenient stores along the Trans-Labrador Highway. It took me 3 weeks, but before I received my flight tickets to the US, I was officially finished with my road map and had even had memorized the limited gas stations that were available in that region. I gave myself one day to catch up some much needed sleep, bouncing back and forth amongst airports for two days, and that next night I was on the road. 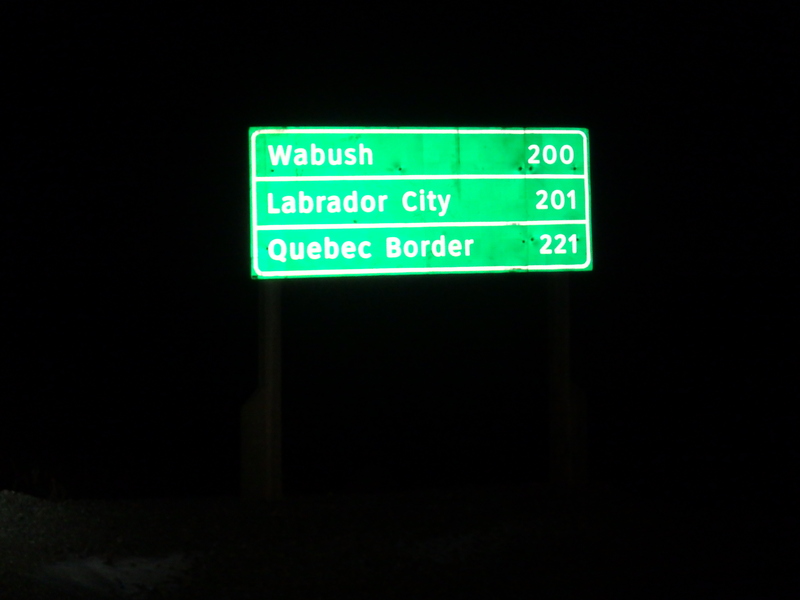 The Southern part of the Trans-Labrador Highway is the most scenic, as it intersects with the Coastal Labrador Highway and continues on towards Quebec. 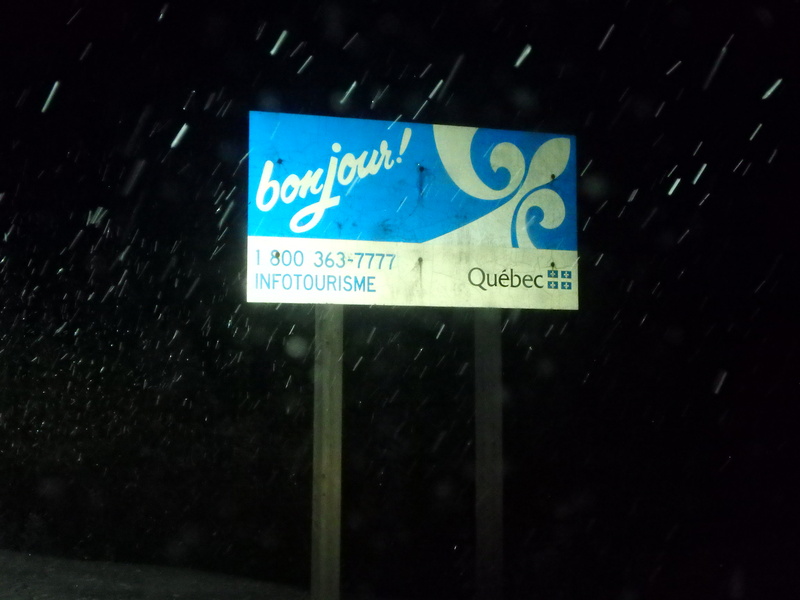 I had stopped by the radio station, CFBS, in Blanc Sablon, Quebec to tell the staff hello and update them on my latest conquest. The staff there is absolutely brilliant, their positivity was the perfect boost that we needed to continue our journey. After dropping by at Dot’s Bakery, we photographed Point Amour Lighthouse, once again, and started towards the Trans-Labrador Highway. 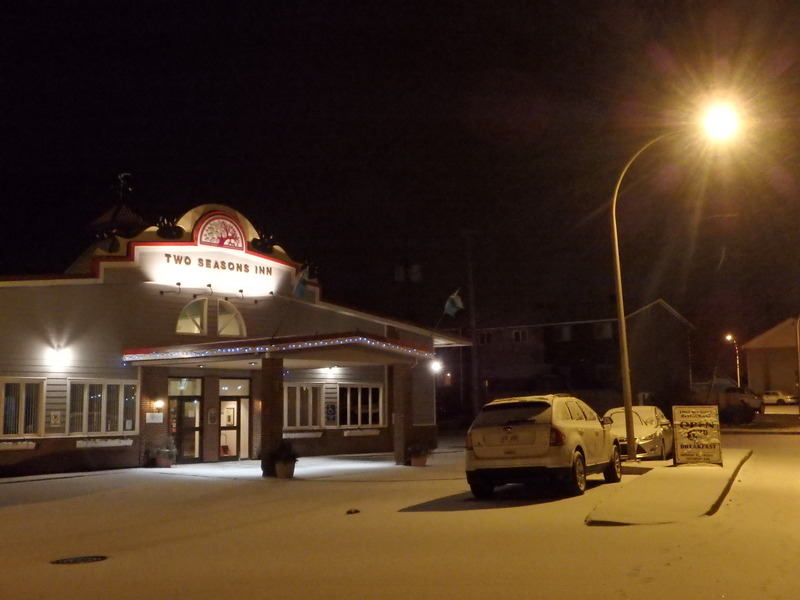 As I filled up my gas tank in Red Bay, I looked around the small coastal town, glanced at the sunset, and it finally sunk that the preparations for 6 months was now into full drive, and I am moments away from hitting the asphalt and gravel surfaced roads ahead of me! This was it, this was the moment that I have dreamed about for so long. I had spent 2 years turning my basic Jeep Wrangler Sport into a proper African safari vehicle, and now she was about to take on the ultimate test! 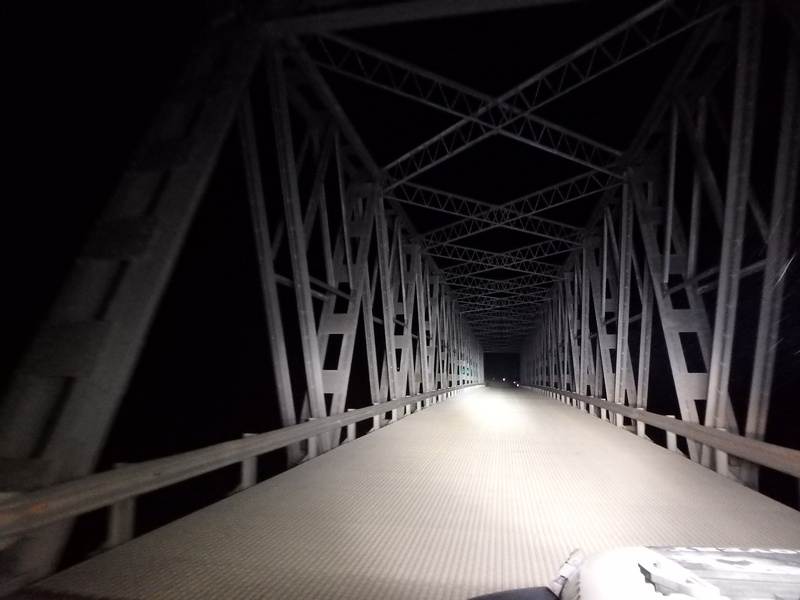 One last deep breath as I secured the gas pump, tightened up the spare fuel containers on the back, and rubbed the thick dirt off my shoes before jumping in the Jeep. 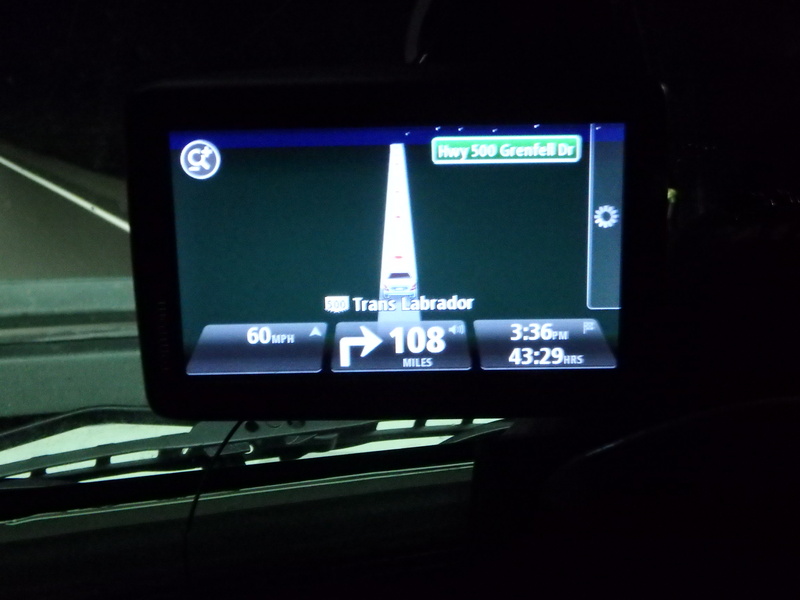 I was minutes away from starting a remote voyage into the unknown. The roads were full of gravel, Josh and I cringed each time a rock bounced off my Jeep’s bumper. 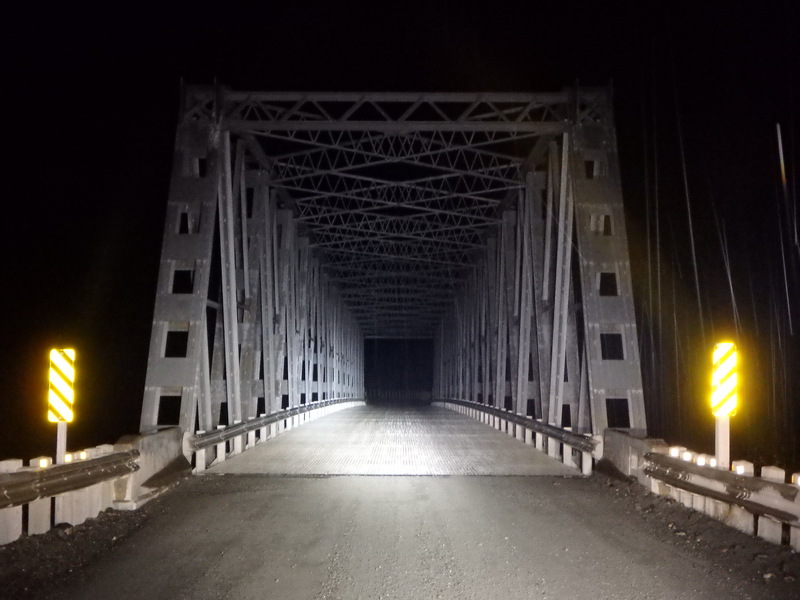 Darkness was getting closer and we literally were in awe of the terrain that we were driving on. I have done a lot of off-roading with the Jeep, and it was guaranteed that at least two of the three days was going to live up to every off-roader enthusiast’s dreams. 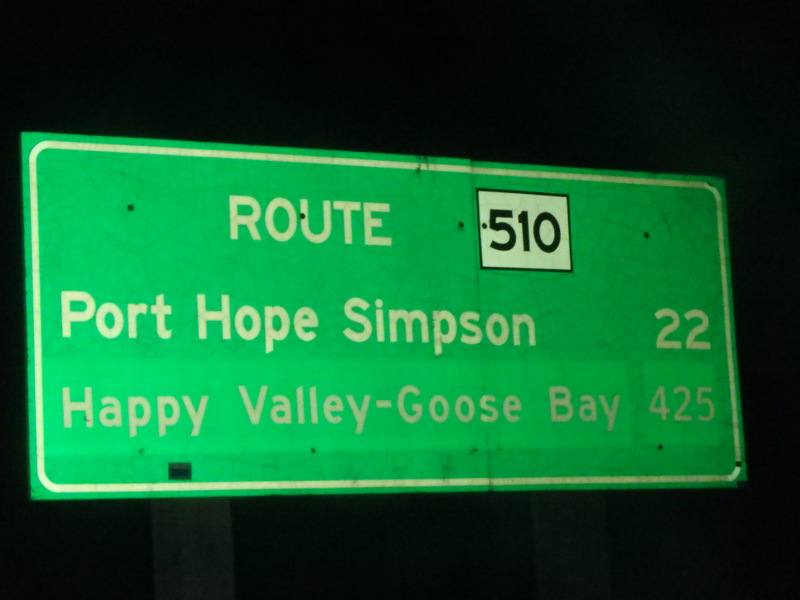 Once I reached Port Hope Simpson, I had decided to stop and fill up, even though I still had a little over half a tank left of gas. I had promised myself on this journey that I would take full advantage of every gas station on this road, even if I was only stopping for a few minutes to fuel up. 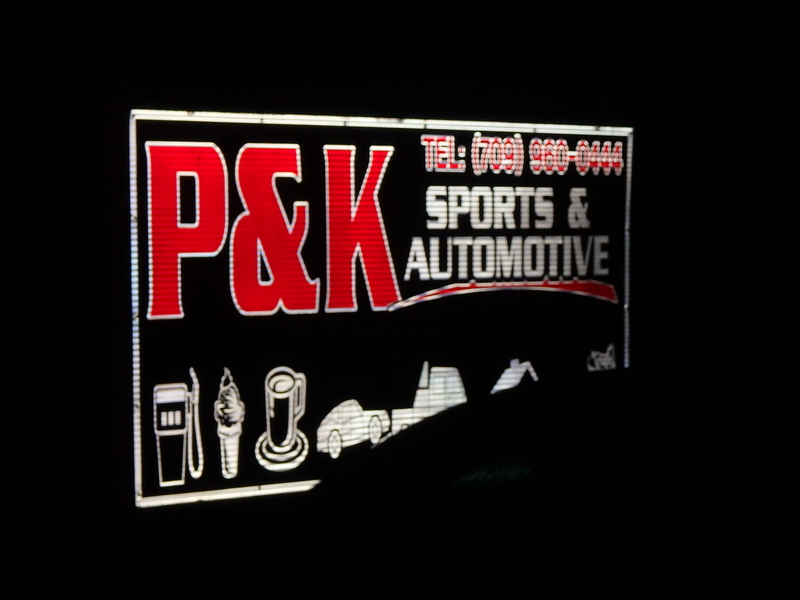 A woman shop owner of P & K Sports & Automotive was really sweet. She greeted me with a huge grin and then asked if I needed any help. I bought a few souvenirs and a few bags of chips for the road, since we had an unlimited supply of water in the backseat. She had started talking about moose hunting and how the season was almost over in Labrador. I went on to tell her how surprisingly good moose burgers were, and she gave me a big grin. She explained earlier that her son had shot a moose, and brought it to the shop to skin it – she said that if I would have seen it after he was done skinning it, that it would have a good travel story. The shop owner walked outside with the woman and daughter, they stood outside for a few minutes looking at my Jeep. 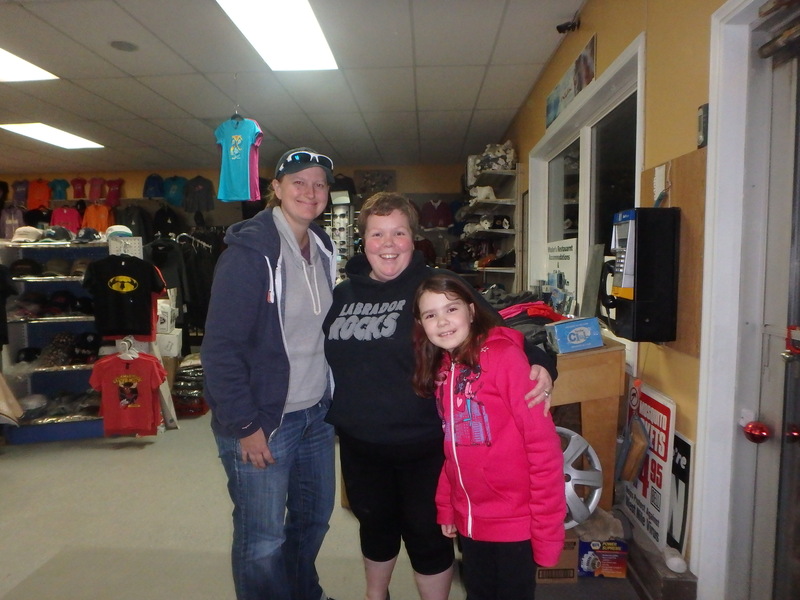 And, all three cheerful faces came back into the store and smiled back at me. They thanked me for stopping by their small town, the local shop, and snapped a photograph, and chatted a bit longer until I got back in the Jeep. 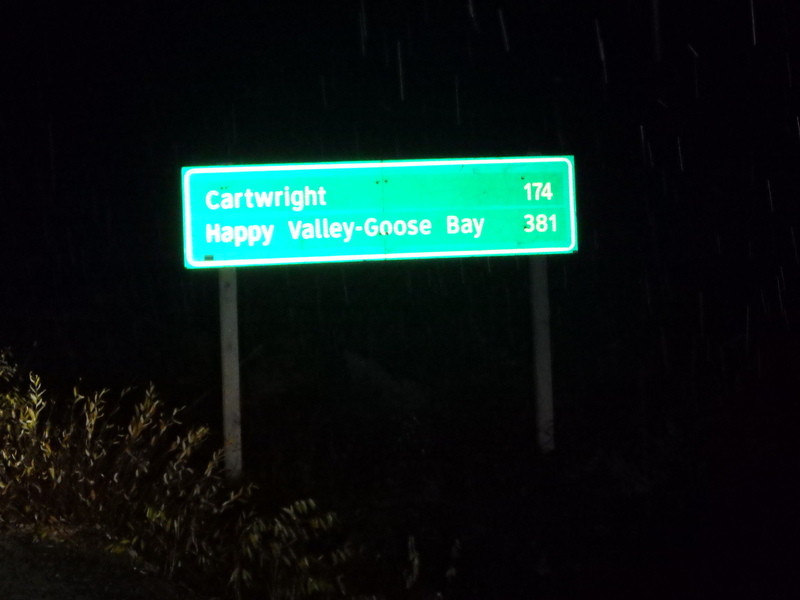 It was an experience that I will never forget, because this town symbolized the kindness that I would continue to receive during my time on the Trans-Labrador Highway. 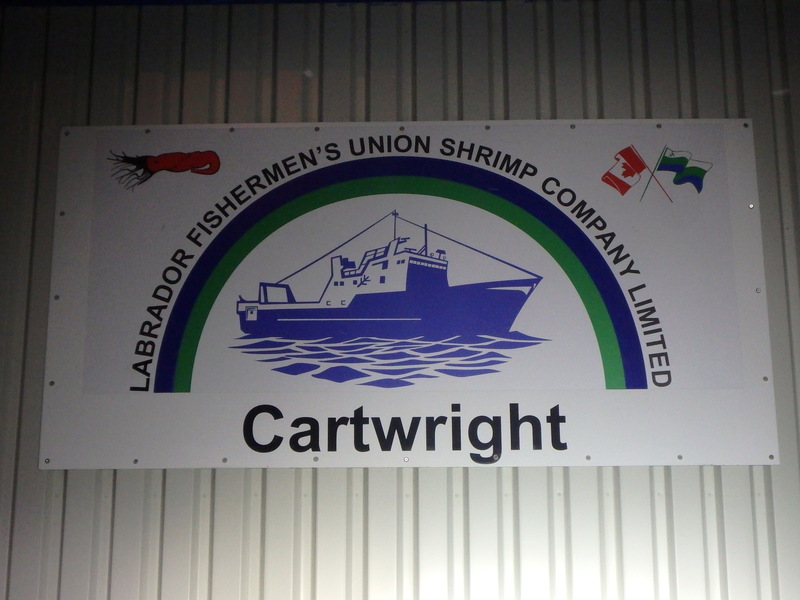 The road to Cartwright led me into the world’s most well-known area for salmon fishing. One of my new friends at the shop told me that presidents will stay up there during the summer months to fish for salmon. Considering I was standing in two feet of snow, I took his word for it. 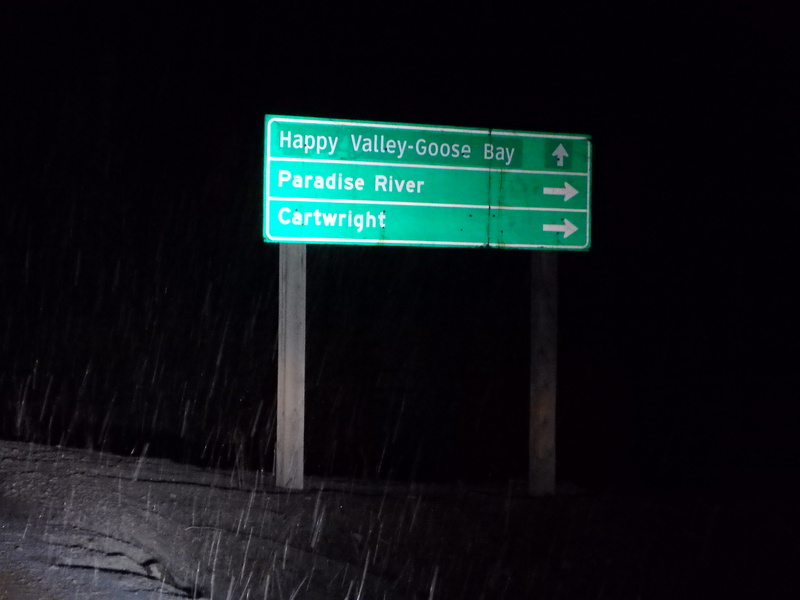 It snowed right after leaving Port Hope Simpson and it kept dumping white flurries everywhere! 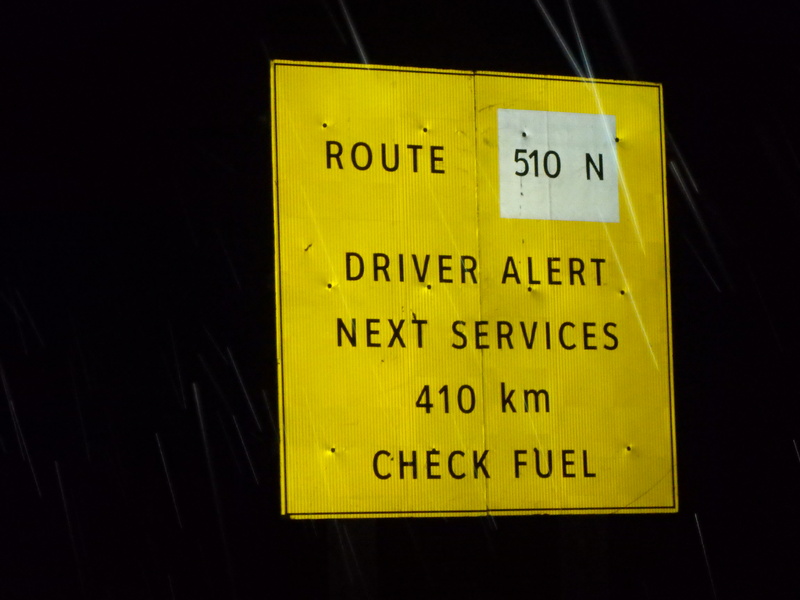 Inches and inches were forming on the roads, the highway, and next to the gas stations. 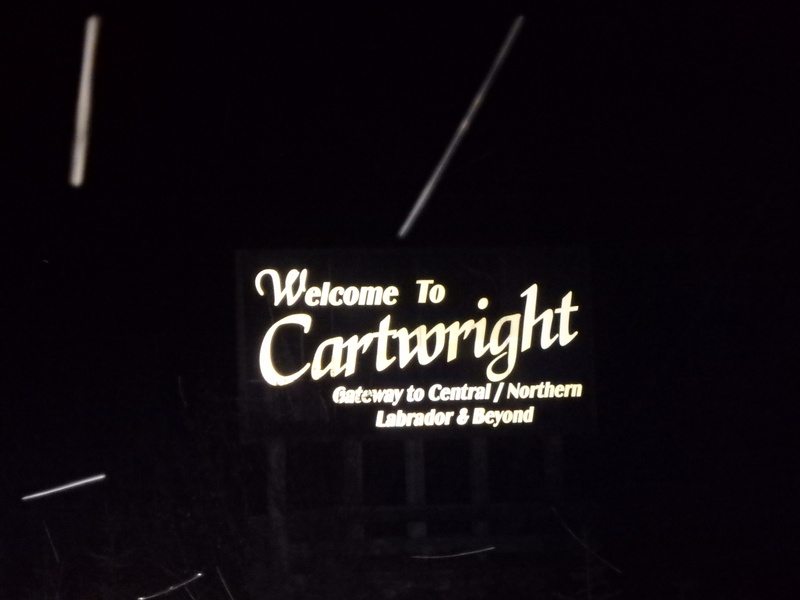 Cartwright is the furthest Northern town that you can go, there are only woods, dirt, and no roads. If you walk for a long period of time you could reach the Torngat Mountains National Park (but you have to hike for a long time, in order to do so!). The only accessible way to the Torngat Mountains National Park is by helicopter, which will drop you off to camp for a few weeks in the mountains. Before my departure, I knew that I had to fuel up not only my gas tank, but two of my spare containers on the back of the Jeep. 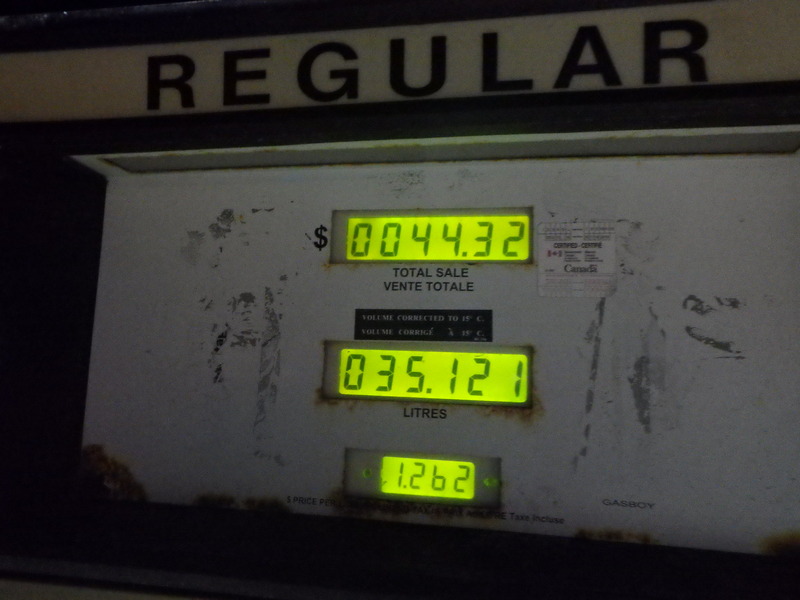 This was going to be an expensive fill up in Cartwright, but I could not risk being stranded in the cold on a very isolated highway. 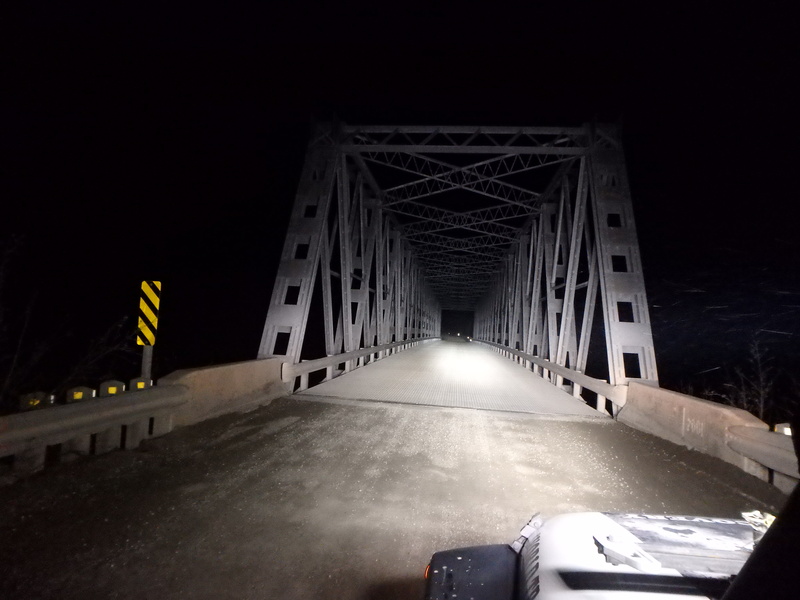 Up until this town, I had not seen any vehicles on the highway yet! As the climate got colder and it got darker, you could feel the nip in the air. Rumor has it when you own a Jeep soft top, the inside gets really cold, especially while driving in negative temperatures. 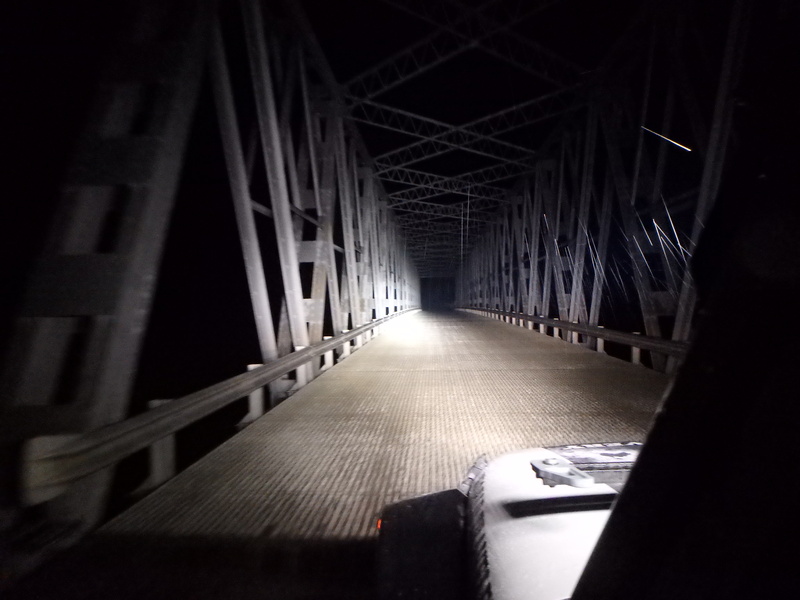 Personally, my heater stayed mostly on low, my brother and I were bundled in cold water gear (mostly hoodies, hats, and jeans), and inside the Jeep was cozy and warm. So, we will keep them rumors for now. 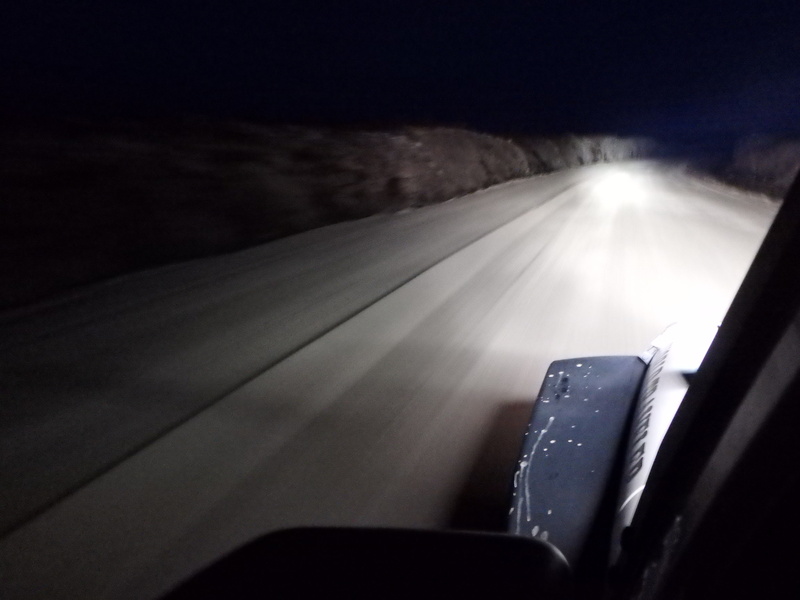 Regardless, we were comfortable, but the roads on the other hand, were covered in sleet, ice, and snow! 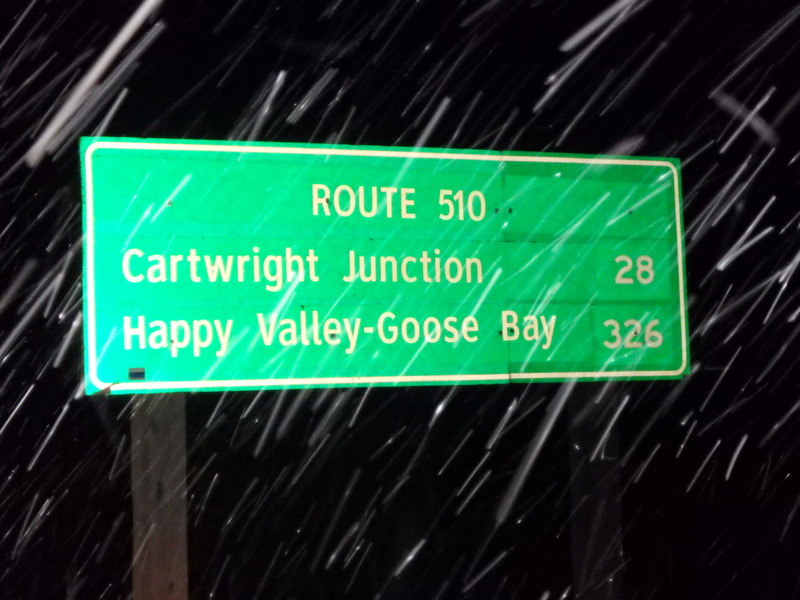 And, this is how the Trans-Labrador Highway venture continued! 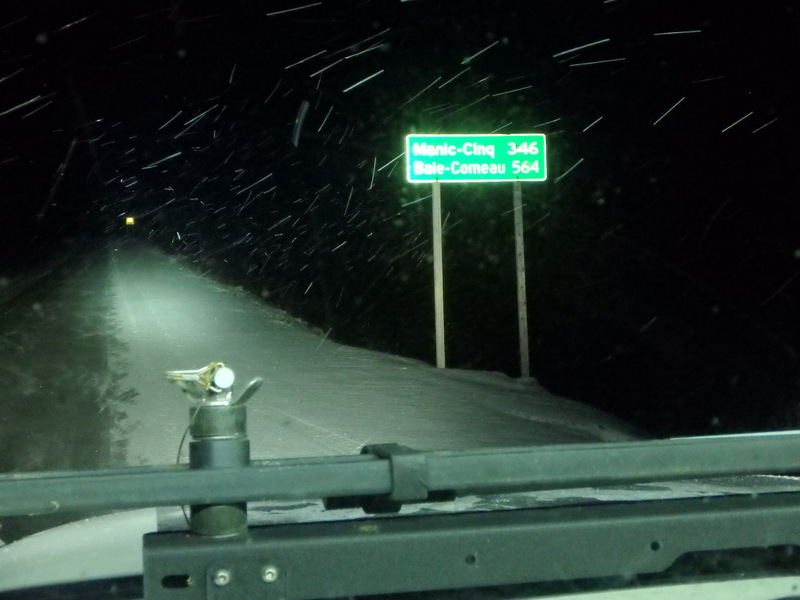 The small intersection from Cartwright to the Trans-Labrador Highway was completely covered in ice and snow. There were a couple of snowshoe hares running across the road as I slowly drove towards the highway. The plow trucks were not in sight, well, actually no vehicles were. It was the first time on this journey where I felt completely alone and somewhat, vulnerable of not knowing what to expect. Were my 33 inch tires going to rough out this adventure with me, and not get a flat? Am I enabling myself to run out of fuel by driving slower than I had originally anticipated? 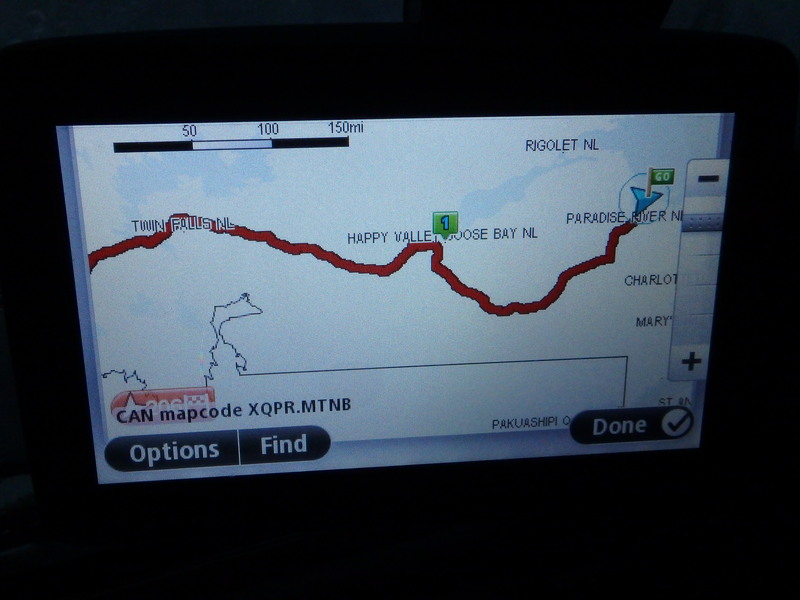 Was I going to encounter any vehicles before getting to Happy Valley/ Goose-Bay or Labrador City? With my brother passed out in the passenger seat, I took a few minutes to reflect on this world tour and the accomplishments that I hoped to achieve in the future. I know that I am meant to travel the world, as this was all that I ever thought about from a very young age and into my adult life – I pushed myself to be here in this moment, and to conquer one of the loneliest roads in the world. 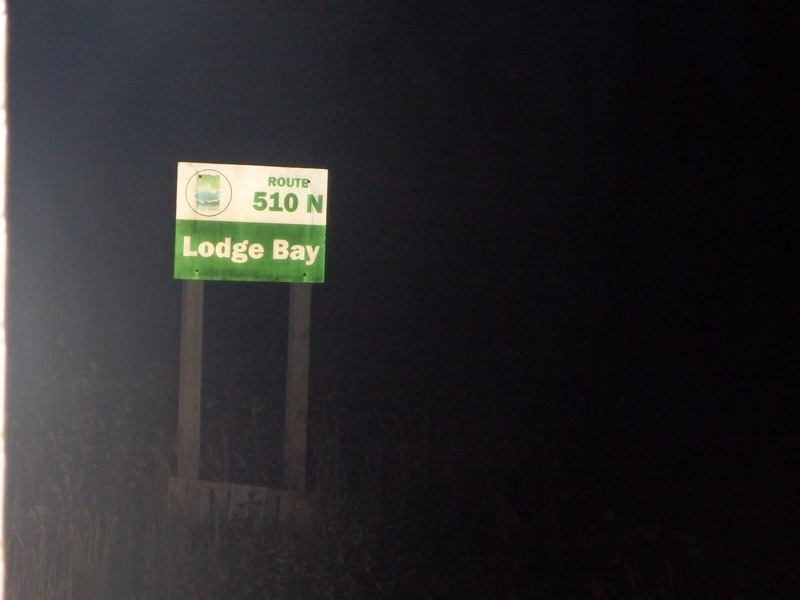 It then hit me, I now know why the Trans-Labrador Highway was and is still called one of the loneliest roads in the world. 1) Slow down when you see large vehicles or transport trucks approaching as gravel may spray and crack a windshield. Please ensure you have emergency supplies and a spare tire on board as the gravel can be sharp. 2) Your vehicle should be serviced before the road trip, ensured that the windshield wiper blades are in good order, plenty of window washer fluid, and make sure that the oil change is up to date. Personally, I had gotten an oil change before I entered Newfoundland, which in return, reassured no oil issues in Labrador. For snow: winter tires are highly recommended between the months of October and May. Optional: metal studs placed on winter tires to remove the factors of slipping, sliding and less gripping on the road. 3) In winter months, snow clearing equipment ALWAYS has the right of way. Important: be cautious of ‘black ice!’ A shovel, blanket, matches, flares, extra windshield washer fluid, spare tire, snacks, and water are critical. 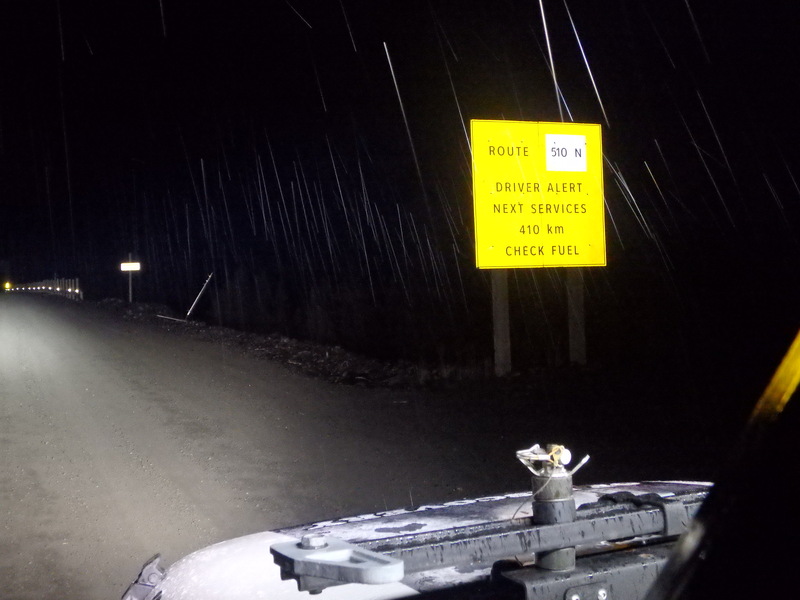 4) Check the road conditions and weather forecast before you depart. 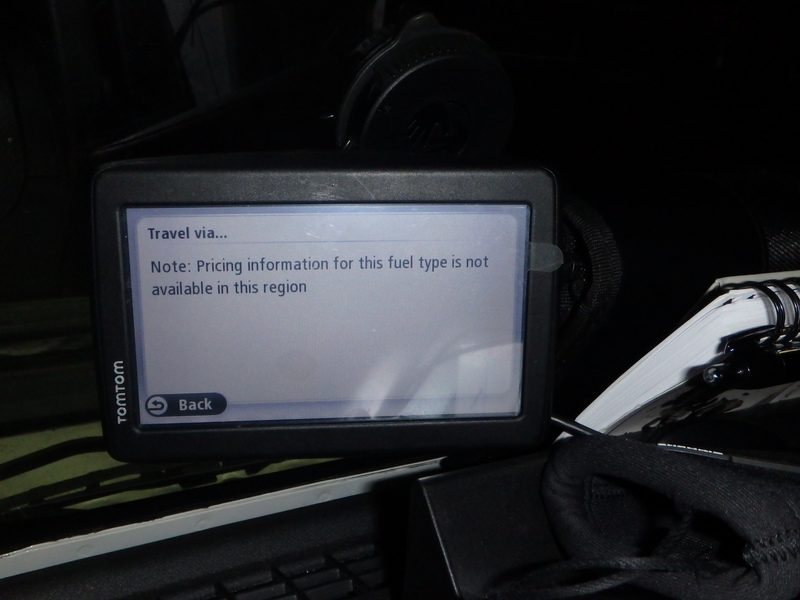 Also, make sure that you have spare fuel canisters in your vehicle, as gas or petrol stations are few and in between! 5) There is no cellular service on the highway. The government has created a safety program so you can borrow a satellite phone for your road trip. This service is completely FREE. Residents of Newfoundland and Labrador must provide their driver’s license, while others must provide a credit card number for replacement if the units are not returned. Satellite phones are programmed to dial directly to the police and are for emergency use only. Pick up points for satellite phones: Wabush (Wabush Hotel), Churchill Falls, Happy Valley (Midway Travel Inn & Hotel North Two), Goose Bay, Port Hope Simpson (Royal Inn/Suites), Charlottetown (Alexis Hotel), Mary’s Harbour (Town Office), L’Anse au Clair (Riverlodge Hotel) and Forteau (Northern Light Inn). 6) If traveling in the winter months, it is recommended to have a ‘block heater’ in the engine that will help prevent the battery from draining and the engine fluids from freezing. A small electrical plug will be visible in the front grill. Using an extension cord, ‘plug in’ your block heater when your car is parked for long periods (mainly overnight). Don’t forget to unplug before you turn on the engine and drive away! When it is extremely cold, it is a good habit to let the car engine warm up for 3-5 minutes, letting it idle before driving. Block heaters can be purchased and installed in Labrador City and Goose Bay, if your vehicle doesn’t have one already. I will admit that I did not hear that a ‘block heater’ would be essential, until I was already in Happy Valley. 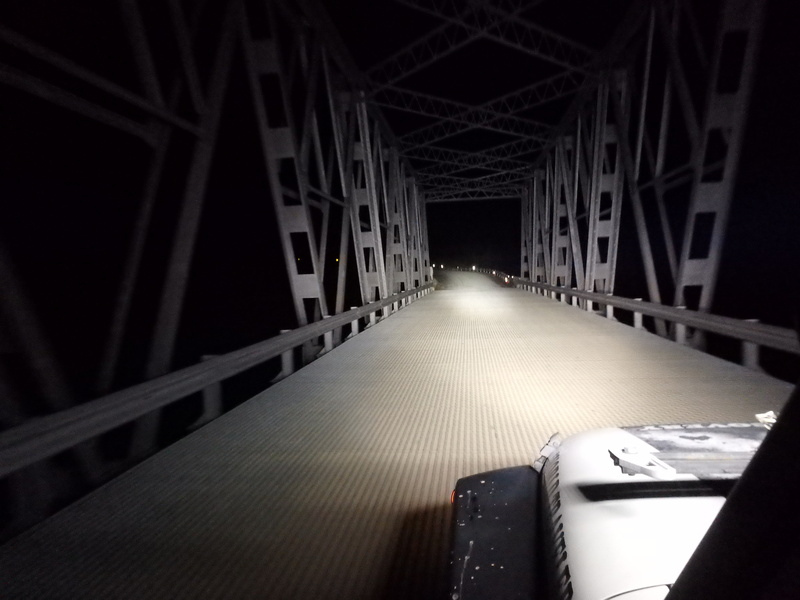 My Jeep worked fine without one, but it depends on your preferences. 7) A portable weather radio with a built-in flashlight and lantern to keep up to date daily on the weather conditions happening around you. Also, it is important to know the highway weather conditions as well. 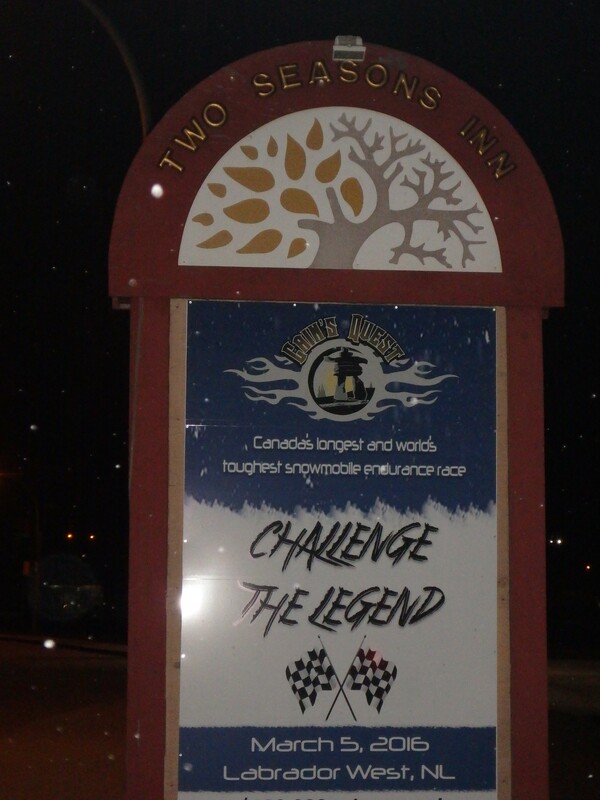 8) In winter, hat, gloves, boots, thermals, winter jackets, and long pants is suggested. Then in summer, toe-closed shoes, shorts/pants, hats, sunglasses, and suntan lotion could definitely come in handy. 9) During the summer months, insectivores or bugs can be plentiful. 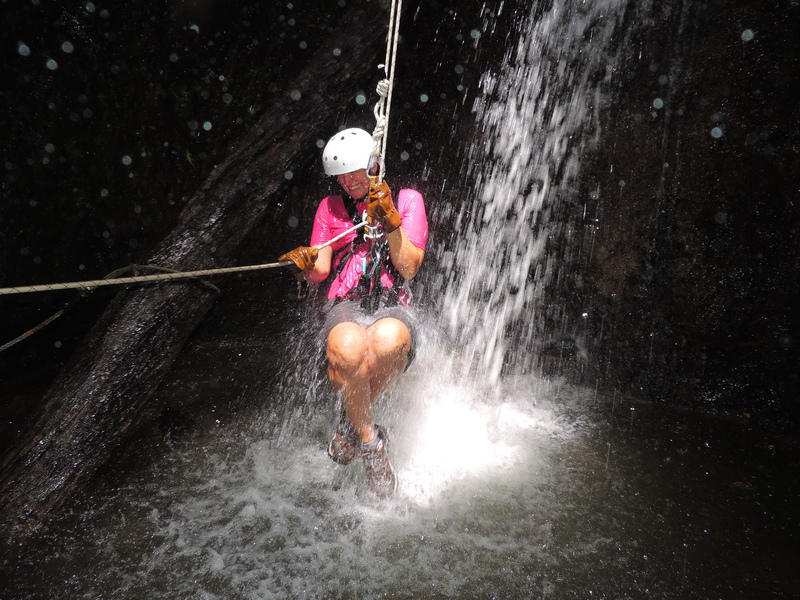 It is best to wear DEET covered clothing, spray for ticks and mosquitos, and wear SPF sunscreen long sleeves. 10) Have fun, be safe, and enjoy the outdoors! Remember to respect the wilderness, animals, and the beautiful surroundings ahead of you! 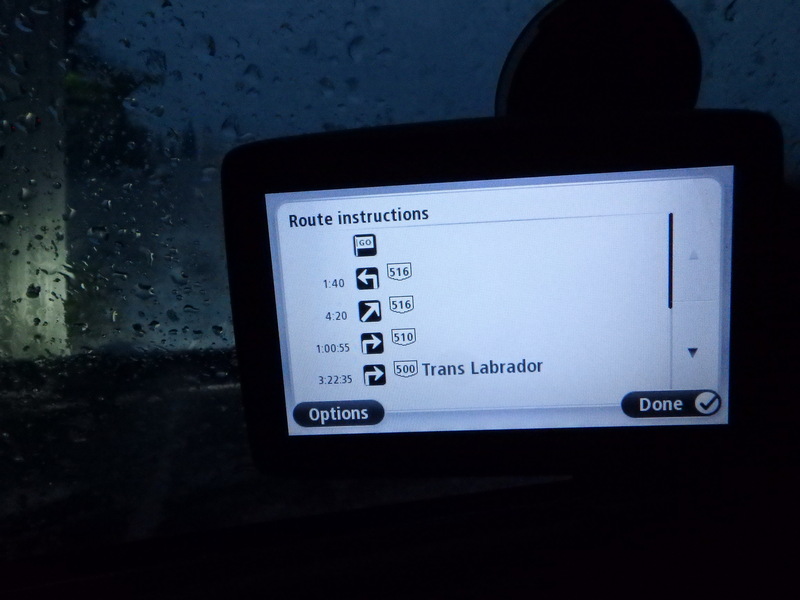 Josh and I’s main mission was to drive the Trans-Labrador Highway for 3 days, a mix of paved and dirt roads. And, of course packed with lots of off-roading! 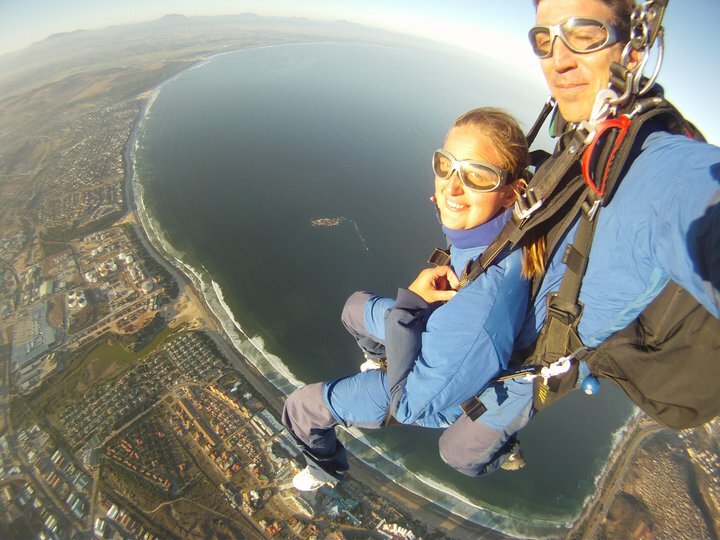 Pumped that we brought you videos, photographs, and more travel stories! 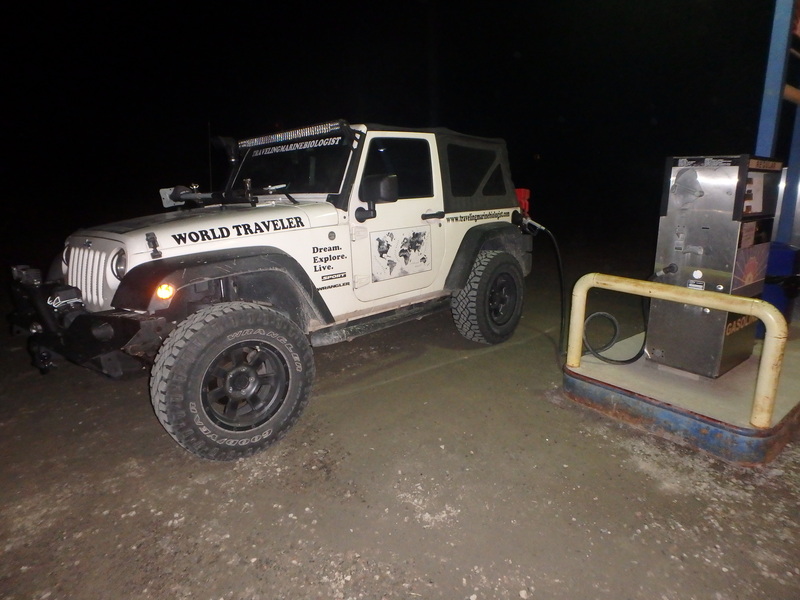 To top it off, there were very few gas stations, so the extra fuel containers on the Jeep definitely came in handy. NextJoin Me in Mexico for Swimming with Whale Sharks!